I have recently come to realize that soap dishes are the exact opposite of coasters. Coasters are best when they are absorbent and hold on to all of the water that gets dripped on them so that they can protect the surface they rest on. Soap dishes are good when they allow all liquids to run straight through them, and are best when they sit above the water as it puddles on the sink counter (allowing airflow and evaporation). So I looked for DIY soap dishes. Immediately the kids-crafting popsicle stick dish projects were out (um, no thank you), and the mosaic tiles/terracotta pot base dishes were out (not enough drainage for handmade soap, it would sit in the water and melt too fast). Neither my husband or I are handy enough with wood working projects to consider any of the build-your-own dish projects I found, and besides, the cost per dish would be more than $4 (which became my standard I held all the other dishes against: Can I buy it cheaper on Amazon?!). 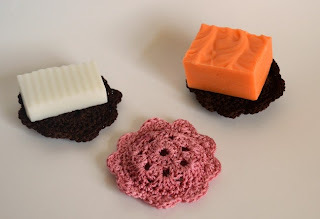 While I did find some gorgeous crochet soap dishes, they were really soap coasters, which (like I said earlier) is the exact opposite of what I was looking for. And the soap saver bags I found were adorable (homemade soap-on-a-rope, yo!) but if I am going to the time/energy/effort to make beautiful soap, I don't want to cover it up with a baggie (although I'm not opposed to it if the soap turns out ugly! Go HERE for an example). But that left me high and dry (or really, low and soggy!) for good soap dish options. I got to thinking (always dangerous!) about yarn. I didn't want to use any yarn that might be absorbent. But #18 nylon thread would hold its shape even if it got wet, it wouldn't absorb any of the water it came into contact with, and if it got covered in slimy soap film it could be rinsed off and would look as good as new. 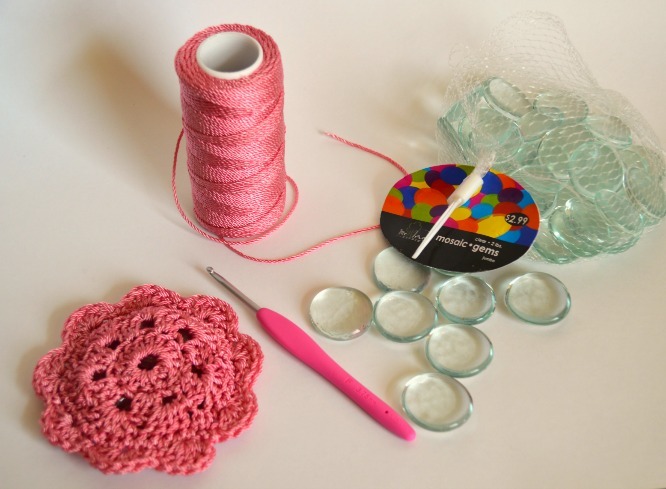 So, armed with the awesome knowledge that glass (flat-backed) decorator marbles make every project better, I set about making a soap doily. It took a few tries (massive crochet fails) to get it perfect, but I am so happy with them! And they're WAY cheaper than Amazon! 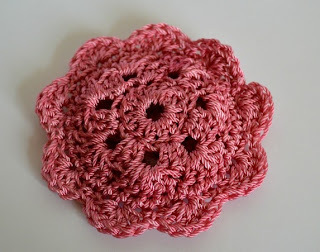 Holding the two doily centers together with wrong sides facing to the center, attach thread to any stitch. Once I got the patten memorized (it's so easy!!) I was able to crank a bunch of these out in about 25 minutes each, so really, there's no excuse to NOT make a bunch of them!! We've been using a couple at the various sinks around the house and they work great! The soap dries beautifully between uses, which, honestly, is what it's all about. This is a great idea. The doilies really look gorgeous. Thanks. Hi Margaret! Thanks so much! I LOVE your thought process! And these are really original and SUCH a super idea, I am so impressed and inspired. Do you think people will get it? I mean how to use them? You are really a bundle of energy! I loved reading how you came up with your solution and now, of course, I want to try it myself! Fantabulous idea. Currently in the process of making for teacher gifts. This would make a lovely present topper with the smaller soaps. Thanks so much for sharing. Thank you for this pattern I have the glass marbles already and was wondering what I could do with them. My hubby bought them when he was on his clay kick but we never used them. Well thanks to you I have a great idea for them. That and I hate the mess soap make on the sink and in the tub soap holder. Thanks Again. Anyway, thx for giving me the right things to use for the soap dish. It holds it in place and doesn't make a squishy mess. Another great diy soap dish is to use the large sponges fur washing your car. Cut them cross-ways about 2" thick (approximately 5 per lg sponge) with a shallow soap shaped cut out about 1/4' deep. The sponge drains quickly if it gets wet and absorbs very little soap. Once the soap cake is used up, you can wash with the sponge 2-3 times.